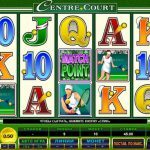 Sport has always been a great inspiration for many online slots, as it is the case with Centre Court from Microgaming. This time we have Wimbledon, the famous Tennis Championship, so let’s win this game together. You do not have to be a fan of this sport to excel in this online slot you have in front of you. Your only job is to land some matching symbols and collect the coins for yourself. When it comes to special features we have couple that we need to mention here. Let’s start with the special symbols since they play the main role here. First we have a Centre Court trophy which acts as a wild and its function is to substitute every other symbol except the scatter to complete a winning combination. What is more, the wild appears stacked during the free spins allowing you to land more wins than ever. 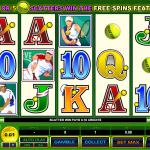 The tennis ball is the scatter and if you land 3, 4 or 5 anywhere on the reels you will receive 18 free spins. The best part during the free spins is that you will receive a random multiplier between x 2 and x 5 on each spin. We would usually expect a tension when we have a game like Centre Court, since it is sports related. And, instead we have a very relaxing game with couple of special symbols that we actually see quite often on the reels. Another great perk of this game is that it offers betting sizes for every player, so even if you are high roller or low roller you will find the right one for your bankroll. This is an awesome game and we advise you to try it out. For all of you fans of the 80s consider playing Crazy 80s a 5 reel slot by MicroGaming.